We just got back from a exhausting road trip to Boston, MA. We brought Melody back to Boston to celebrate my MIL's 70th Birthday. And for her to meet the rest of our family that haven't seen her yet. Traveling with a baby and 2 dogs is a lot of work! I still have to unpack and put things away. While I get my house/life in order, let me distract you with photos of what we did last weekend during a beautiful NYC weekend. DH had his hands full. The boys were super excited to go to the park. By the time we got to the park, Melody was asleep. That does not look comfortable. We stopped by Cake Man Raven's bakery for his famous Red Velvet Cake. I got Red Velvet Cupcakes instead. 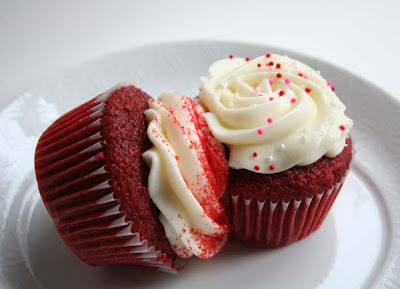 Wow, these are the best Red Velvet Cupcakes I have ever had. Moist and not too sweet, a perfect balance with the frosting. I caved and went back to the Brooklyn Flea to buy some Lotta Jansdotter fabric. She didn't have green fabrics on display so I asked Lotta if she had anymore colors to choose from. She pulled out a bin and let me rummage around. I found the green patterned fabric and I already know what I will make with it (a project from her book). The orange one will go into my fabric collection. Progress on Trellis has been slow. So far, I got the right front done. I used the 3 needle bind off on the shoulder since many people have complained how hard it is to graft it. 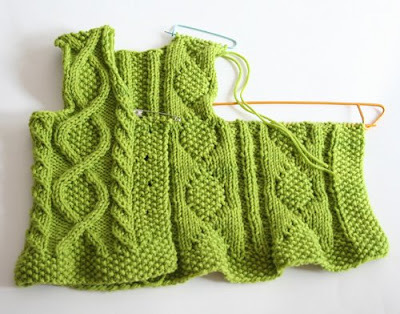 This sweater takes a lot of concentration, so I often work on easier projects when I don't have the energy/time to devote to Trellis. I can't imagine traveling with 2 dogs...Lewis is such a handful and he is only one sweet puppy!! You definately did have beautiful weather...hopefully we'll get some here soon. Cute Melody looks like she is having a good nap, I agree with you - doesn't look comfy! 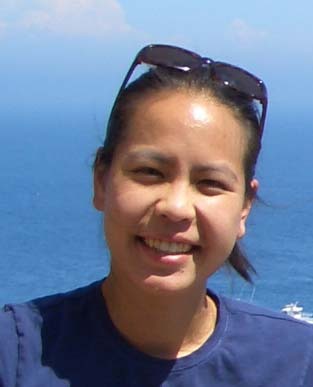 Your blog pics are always so entertaining and lovely. You are not only talented but have such a full life. Tag Oiyi! You Make My Day...check my blog for details! I knew it! 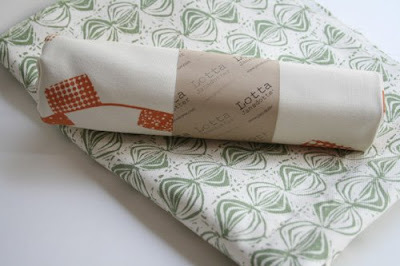 Who can resist Lotte's beautiful fabrics! 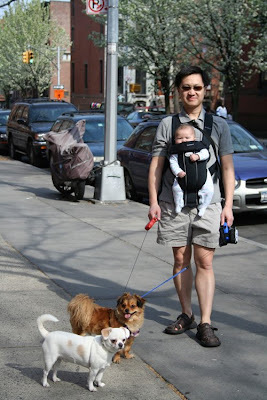 I can't imagining travel with two dogs AND a baby. I have enough trouble taking care of myself! Those cupcakes look soooo good. What are you gonna make with the fabric? Which project from her book? And how does the fabric feel? Is it cotton canvas? Those cupcakes look delicious! Yum... Glad you had a nice trip to you MIL. Have fun playing with your new fabric! I have never understood how babies can sleep in those uncomfortable positions! Looks like a great weekend. Babies can seem to sleep in the most uncomfortable positions. I love red velvet cake too ;) Great fabric, and trellis is looking beautiful! That one must take concentration for sure. Thanks for the great photos! Melody does look very uncomfortable. It's amazing how babies can sleep in almost any position! Wish I had one of those cupcakes! Yummy! Great fabrics too! A nice weekend, for sure! Your Trellis is coming along nicely. I think you're making great progress on it. You have one really cute baby girl. I always enjoy your photos. I haven't had red velvet in so long-yummers. Isn't funny how children can sleep anywhere in just about any position and they're perfectly fine. Those cupcakes look delicious, I haven't had red velvet cake in a long time. Melody looks like she's basking in the sun's warmth! The Trellis is looking great! LOVE the green. That travel sounds like a lot of work, it must be great to be back - you certainly look like you were were making the most of the lovely weekend. 2 dogs + a baby?! That is insane!! But it sounds like it was fun! You are going to be done with trellis before you know it! melody looks so funny sleeping like that! I feel like her, sometimes I nod off while standing up on the subway! The red velvet cupcakes are so pleasing to the eye, all red and bright! I want one!!!! 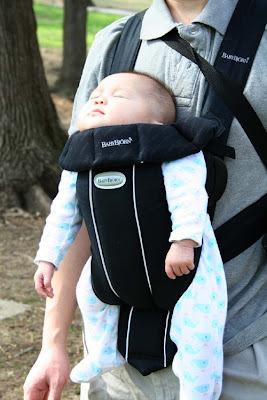 Awww, little baby asleep in a sling = adorable!! Sounds like a nice trip, gotta love the Baby Bjorns! Those cupcakes are making me hungry!